I've always been afraid to make any sort of Indian pickle. Too much labor. Too much effort if they have to be cooked gently in the warmth of the sun. No instant gratification as they take months to pickle. One could just as well step out to the Indian grocery store and buy excellent pickles, as good as homemade ones. But the lemon pickles without oil are hard to find. So far I have only found Priya's Lime Pickle that has no oil. All other pickles have a thick layer of oil, which helps preserve the pickle but I like my lemon pickle without any oil. I was forced to take the plunge when I ran out of the small bottles of two lemon pickles my sister sent me in February this year, both made without any oil. One with green chillies and the other with red chilli powder. I had a bunch of beautiful lemons that were sitting invitingly on the counter - so inviting that I ignored the fact that the peel is much thicker than the Indian lemon and decided to just go for it. I used an old family recipe that has been passed down through several generations. The beauty of these pickles is enhanced by the "no-oil" factor. Wash and dry 6 lemons thoroughly. (12 lemons if you are in India as they are much smaller than the lemons in the US.) There should be no water on the lemons or in your jar. This is very important. Slice off the stalk scar as shown below. 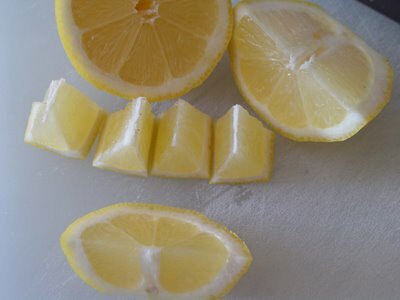 Cut the lemon into quarters and then cut each quarter into a half along the length. Then cut each resulting piece into quarters or thirds. Fill the glass jar as you go along. Your jar will soon look like it will overflow. Don't worry. Everything will settle down and there will be tons of space in the jar. Add 1/4 cup chilli powder. 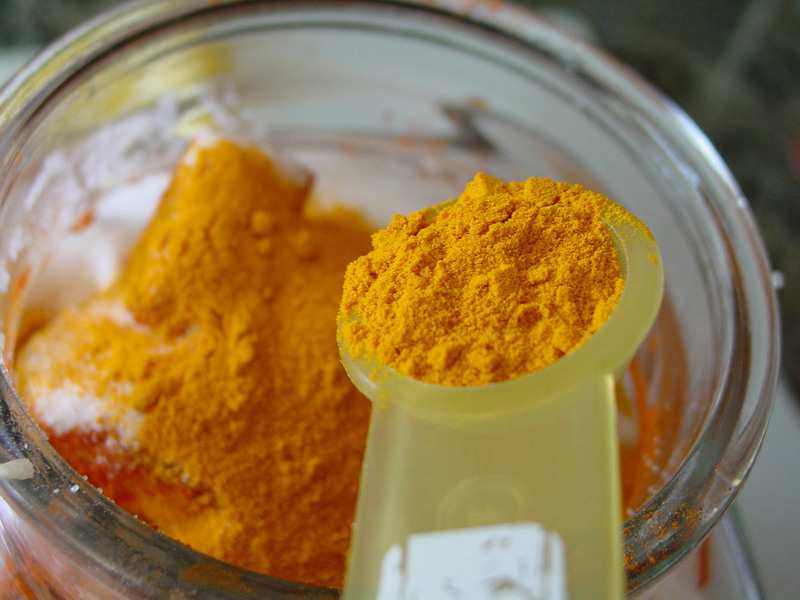 Add 3 tsp of turmeric powder and shake the jar about to help the powders get to as many lemons as possible. Next you need 1 tsp methi seeds. And 1/4 tsp asafoetida or hing powder. Roast these three ingredients on medium flame for about 4-5 minutes till there is a mouth-watering aroma in your kitchen and the methi seeds look a little tanned. They should not look sun-burnt, just nicely tanned. Grind these in your coffee grinder. What? You think your coffee will smell of methi and hing from here onwards? Tch! Tch! You mean you actually grind coffee beans in your coffee grinder? Never do that. Repeat after me: Coffee grinders are for grinding spices! Well done! Now add this powdered mix to the jar. The lemons should have started oozing juice already. Add the juice of 1 lemon. If necessary, use a dry palette knife or a dry table knife to stir the contents of the jar. See how the lemons have become limp and there is so much space in the jar? The jar must be placed in the sun to cook slowly in its warmth. Give it a good shake as you put it out and bring it in each day. Your pickle should be ready in about 2 months when the peel has softened and is no longer crisp. See what I mean about labor intensive? Putting it together takes less than 20 minutes. But after that, it's a lot of effort! Nevertheless I am very excited about it. Here is what my pickle looks like after 1 whole day in the sun. My home is in the East-West direction so I just follow the sun as it moves over from the backyard to the front and leave it out till just before sunset. It's nice and warm when I bring it in. I am really looking forward to this pickle. I hope after all this effort, it works out!! A lot of people cook it gently on the stove. But in my family, we've always followed this procedure and all of us prefer this taste. Think you want to join me in trying this out? Go ahead! And if you do, be sure to let me know how it's doing. Or just wait to see how mine does before you try yours out. After all we have the whole summer ahead of us! I'll be posting an update every week or so. The juices will start thickening as it cooks in the sun. Update Feb 11, 2007: I made lemon pickle from 3lb of Sunkist lemons on the stove today. After the low temperatures ruined so much of California's citrus crop, I gave up hope of seeing Meyer lemons in the stores here. I decided not to wait any longer and purchased a 3lb bag of citron lemons. They are the best looking lemons I could find. The organic ones at Whole Foods and Wild Oats looked really sad. Anyway, I cooked it on low, uncovered for 5 hours, stirring every so often until the juices thickened. The final consistency should be similar to that of thick pancake batter. The only thing to watch out for: ensure that the juices don't start sticking to the bottom of the pan and charring. The juices will start burning and the pickle will get a strange taste. I made one mistake: I added 1/2 cup of red chilli powder instead of 1/4 cup. I was trying to do too many things all at once and while this level of heat may be fine for many folks, it's way too much for us. I added 1/4 cup sugar to balance it out but it's still too fiery. I am planning to buy another 3 lb bag and make more pickle on the stove, but without any red chilli powder and mix the two. Which one is better? The one cooked in the sun has far more flavor. Slow-cooking in the sun rules! Thanks Manisha!!! This is great. A traditional recipe that's been passed down generations, huh? :) How sweet of you to share it. Can I try it without sugar? I'm not fond of even a bit sweetness in my pickles. But then, I have to wait and see how summer here, in Toronto is like to be able to try it. Kay, it's a simple recipe and it was a pickle we grew up with. There are many memories associated with it! There are other pickles that my aunts make that I don't think I would even attempt but this is easy. The tedious part is putting it out in the sun every day. The sugar is required in this recipe to balance the chilli powder and the acid. This pickle does not taste sweet. You could try a small batch without any sugar and see how it appeals to you. I am going to make another lemon pickle: it's got green chillies, whole methi seeds and ginger. I need to confirm the ingredients for that one. I don't think it has sugar but I am not sure. Once I make that, I will make a similar post and ping you. How's that sound? Thats a great post Manisha. Thanks :). 1/2 cup sugar? That's got to be delicious. I like sweet pickles(must be sour and spicy as well). But I have never tried adding more than a tbsp of sugar in my pickles. RP, I was surprised when I heard there was that much sugar in it, too. The original recipe has small vati as the measure, which is about 1/2 cup. But this pickle is not sweet. It's more spicy and tangy than anything else. I tasted the juices and compared them with the real thing that my sister sent across and the taste is identical. I felt so validated by that! Sounds silly, but when you're cooking age-old recipes with ingredients as they are found in the US, it can get tricky trying to achieve the same flavors and tastes. Shilpa, I am sure you have some recipes for scrumptious amchi pickles up your sleeve. I will look forward to your posts! nice recipe, with a perfect presentation and style and awesome pictures. Manisha, you guessed right!!!. Looking at your great pics, I was thinking to post some of aayi's pickles. Her pickles are loved by everybody :). But few of them are so difficult to do, I am not sure I will be able to learn them :(.But ofcourse I will post abt the simple ones. Just got in here through Kay's links. Pickels are put just like the way you do during marriage, just one question.. how long can you store it, do we have to refrigerate it after it pickels. BTW can i add you up in my blogroll? Shilpa, I know what you mean. Some of the recipes are quite involved. Like the pickle we make of the really small mangoes (aamlicha loncha). They need to be salted and then placed under a weight before doing anything further. One of my aunts, who is no longer with us, was the expert and we drooled every summer for our share to be delivered. A lot of the ingredients, like this small mango, are difficult to find here. And even if can get hold of them, the flavors are very different. I will be looking forward to your posts! Aparna, as far as I can remember this pickle was never refrigerated when my mother made it. However, I do refrigerate it because we're a much smaller family now and I am the chief (sole) pickle fanatic so I need to get as much mileage out of it as possible. Feel free to link to me and thank you very much for the honor! I love this picture-intensive post! Just what a novice like me needs. I will make this soon. I promise, I will. Thanks for sharing! A great post with clear instructions and pictures to complement them. Good work. I have always loved this 'loncha'. My mother, too, makes it with sugar and without oil. I am not too sure of the fenugreek seeds, though. I would have loved to join hands with you in this project, but the problems start from Step 15. The Sun-God is not happy with us here in Germany. We are having dull, cloudy days with max. temperatures of 15°C. Moreover, my house is not in pickle-friendly East-West direction. *sob* Can you please post a recipe in future, which does not require sunshine? As far as thick skin, you may want to try either Palestinian Sweet Limes or Meyer Lemons instead of the standard Eureka lemons you get in most supermarkets - both have thin skin and a lovely taste. Not quite the same as regular lemons, but lovely. First of all - This looked like a 5 second TV show on lemon pickle with fancy pictures although yours was ad-free. Whee!! Secondly, this is the first time I have seen something being cooked going solar - isn't that awesome. Sury, I'm a novice at this, too. So stay tuned as I post pictures of the progress on this pickle! If you do try it, keep me in the loop viz. progress. Vaishali, you can gently warm this pickle till the lemons cook. Many people make it this way. The chances of spoiling due to mold/fungus growing on it from exposure to moisture are then reduced. I do that for some of the sweet mango relishes we make but for this lemon pickle in particular, I prefer the sun-cooked flavor. Kind of like the difference between real sun-dried tomatoes and faux sun-dried tomatoes made in the oven. Deepak of Indian-Recipe, I apologize if this offends you but I deleted your post as I have a strong aversion to the keyword spam you have on the homepage of your web site. Best of luck with your web site. I am a bit worried as we seem to be in the throes of a day that is atypical of our dubious 300 days of sunshine. It might even rain and I might even like that because my yard needs the water so badly and last month's water bill still has me in shock! Shankari, it's good to have you at IFR! 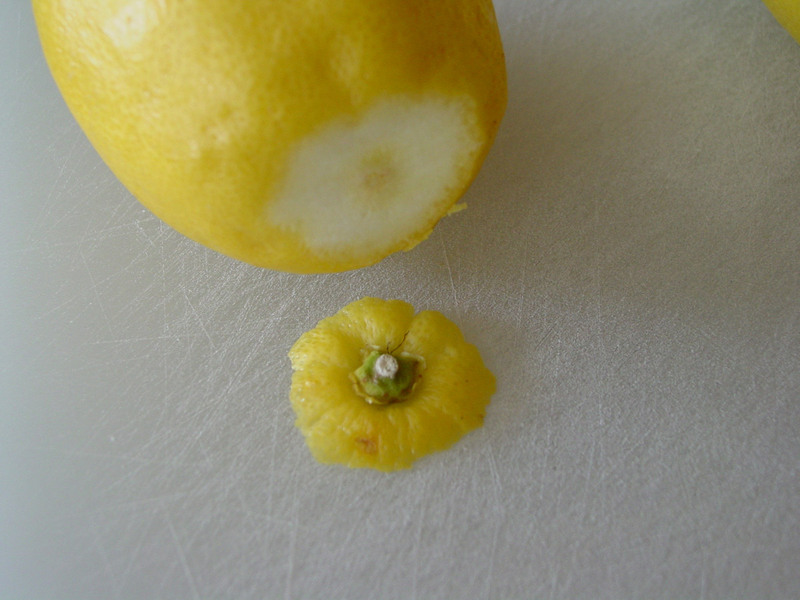 Meyer lemons are often available at Whole Foods, at least here in CA. I think they might possibly be too sweet for this pickle, but they are my favorite lemon. Palestinian Sweet Limes are probably very close in character to Indian lemons. I don't know if those would be available at Whole Foods, but you could ask. Here is Northern California we can get them at Berkeley Bowl or sometimes farmers markets. There is a lemon confit that I want to try. And if these lemons are similar to the Indian limboo then I will make the lemon pickle green chilli and ginger with these instead of bulk bag I bought from Sam's. I had an Indian pickle making party a few weeks ago. We made two kinds of lemon pickles, but it's too bad I didn't have your recipe (and excellent photographs and clear description) as a third. Now that the days are long here, I might give it a try. Hey Marc, welcome to IFR! A pickle making party?! That's a fantastic idea! How many and which pickles did you make? I have organic carrots sitting in my refrigerator. I need to either make gajjar halwa or pickle them. If you have any ideas, I'd love to hear them! Hi, Manisha--thanks for your comment on Tea & Cookies. I am so delighted to discover your blog! I had heard about Indian lemon pickles (I think perhaps Marc mentioned it) and have been trying to find a recipe. Thank you so much! I don't live in a particularly sunny area (that San Francisco fog), but I will give it a go. I am a big pickle fanatic and love lemons something fierce. How would these be served--as part of a dish or on the side? Thank you. Wonderful blog, I will be back! Tea, it's great to have you here! Thank you so much for the compliments! In general, Indian pickles are served in very small quantities on the side. You nibble at them rather than take regular bites. They are usually very spicy and tangy and also high in sodium. If you do make this pickle, try to give it as much sun as possible, keeping a close watch for bubbles. On the appearance of the first few bubbles, I would heat it on a low flame to ensure that it doesn't get moldy. There is no need to put it out in the sun once that has been done. It's ready to eat. Hi Shammi! So good to have you here at IFR! Maybe your mother's recipe is the one that Kay is looking for. Let me know if you do try it out. The juices in mine have thickened and I will be posting an update soon! Hi! I would love to try your pickle recipe, but I have a couple of problems: I live in an apartment that has a very shady balcony only, and partial sun in the windows, so I'll go the stove-cooking route. I live in Budapest, Hungary and I have a hard time tracking down exotic (to Central Europe) ingredients. Would there be any common subsctitutions for hing powder and fenugreek seeds? Also, can I use regular mustard seeds instead of black mustard seeds? 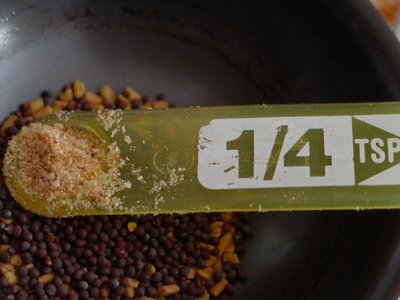 I don't know of any substitutes for either asafoetida (hing) or fenugreek seeds (methi) so I asked my knowledgeable friends at A-S and they pretty much said the same thing. There were a couple of suggestions: Look in your local phone directory for an Indian restaurant and ask them where they get their supplies from. Tell them the quantities you need and they may even give you what you want. The other thing you could do is order from online stores. 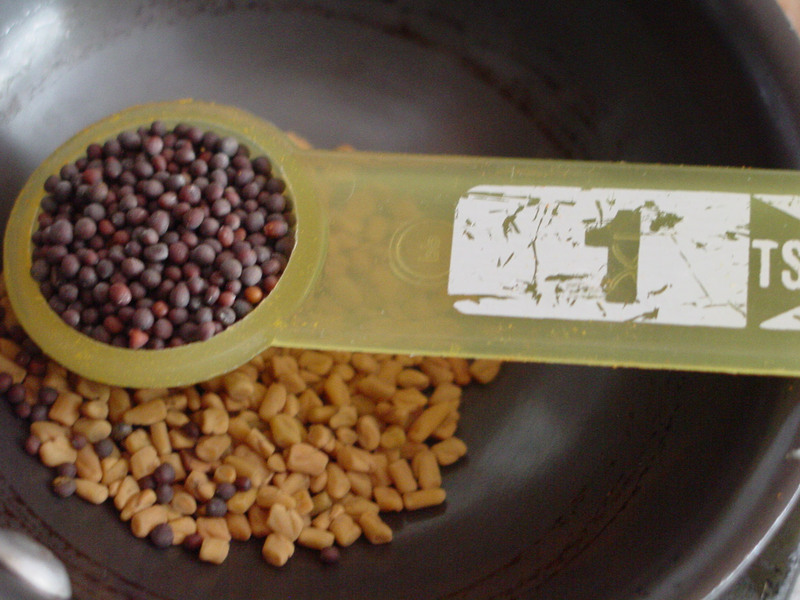 Do you have the red mustard seeds? I would go ahead and use those, if I were in your shoes. Let me know if are still stuck and we could try and find other solutions. Thanks for the suggestions. 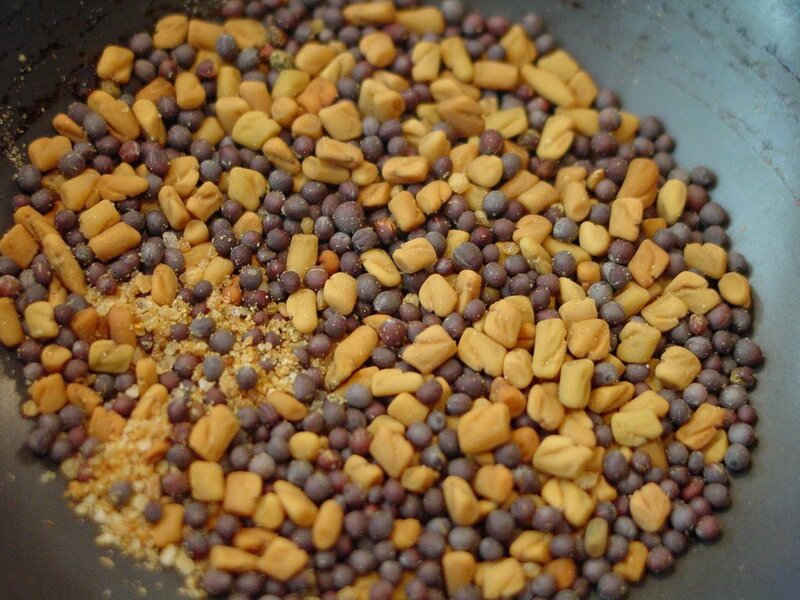 I am happy to report that I went to Vienna yesterday and on their fabulous market I found both asofetaida and fenugreek, and my mom could supply me with balck mustard seeds. So I am all set now, yay! I'll try cooking up this delicacy, I can't wait. Is there anything particular that I should pay attention to with the cooking method? Or should I just dump it all in a pot and simmer until the lemons are cooked, skins, soft? Also, how long does this keep in the fridge? Now, you have me in a little bit of a pickle. :-D This is my first attempt at making a lemon pickle. I don't have any experience with cooking it on the stove-top. However, I have made mango pickles on the stove-top. The trick with those pickles was to cook it on low heat so that the juices were released slowly as the fruit cooked. You will need to keep stirring as the juices thicken so that the pickle doesn't char or burn. 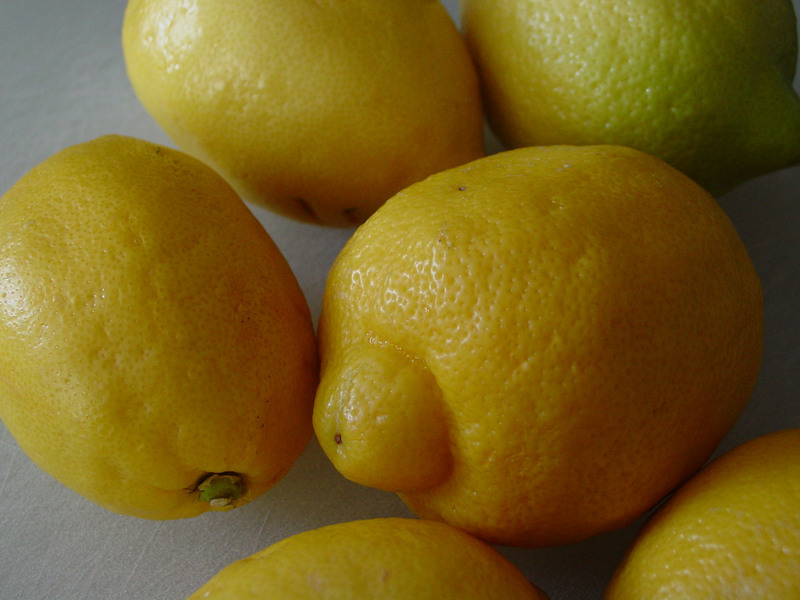 The lemons should be cooked till they are soft and no longer have a bitter after-taste. I found this recipe for a sweet lemon pickle where the lemons are steeped in their juices for a week before it is cooked. Let me know what route you chose and the results. In the meanwhile, I will try to touch base with my family in India to see if they have any suggestions for stove-top cooking of this lemon pickle. This is the first time I m visiitng your blog and I must say ur loncha recipe is impressive. I m buying lemons tommorow, just for the pickle, I am surely going to try this out. My only prob is I dont have a coffe grinder and I know that a teaspoon of seeds are not going ot get ground in my mixie. What do u suggest for that ? Should I skip the seeds or do u have any other suggestions ? Neelu, welcome to IFR! Coffee grinders are fairly inexpensive. I have a Krups that I bought on sale for max $15. I think you should be able to get a Toastmaster for less. A coffee grinder is good to have on hand for making other masalas, too. The other option is to pound them in a mortar with a pestle. You have a beautiful blog, and I love that you do your own pictures. In Summer when fruit is inexpensive and beautiful I often buy heaps to look at, smell and cook with. Thanks to you, now I have a sensible reason own a big bowl full of lemons. :-) Lemon-ginger sounds very good, too. Elizabeth, welcome to IFR! I am very happy to have you here! My lemon pickle is ready in record time thanks to the Colorado sun. I need to post an update about that soon. I haven't yet found the lemons that Diane recommended so I started on a carrot pickle instead. I had to use up all the green chillies I had bought in anticipation in a large batch of green chutney instead. I love summer, too! We picked sour cherries from a neighbor's tree the other day and I made a cherry compote with brandy. The cherries were a bit too sour but we enjoyed it with vanilla ice-cream, nevertheless. Hi Manisha! I live in DC where it currently is 100 degrees and hotter on my front porch so I thought that it was the ideal day to try your lemon pickle. Lemon pickle is my absolute favorite and I've been dying for some real lemon pickle, the kind that my mother-in-law makes. This might just do it. I'll send a pic of the result soon. Tashie, welcome! Make the most of this heat wave! If the storms move in, like we are hoping they will this coming week for us in Colorado, you can do what RP of My Workshop did as she says here and here. She has posted a picture of her lemon pickle and it's lokoing really good! I haven't cooked a lemon pickle on the stove yet but I think that is what I will try next, with a smaller batch of lemons. Those pictures are wonderful - thanks for making it so easy to understand! I love the pickle I've had in resturaunts, and wanted to try to make some myself... some friends gave me instructions, but your pics filled in the gaps. I can't wait to taste it! Gazby, welcome! Better make haste while the sun shines because summer is almost gone. Unless you have abundant sunshine where you live. My lime pickle is ready and I hope to make a detailed post on that within this week. I am very excited because it is very delicious and the ginger and the green chillies give it a wonderful flavor that is very different from that of this lemon pickle. whew!! i loved the way u presented the recipe step by step(fotos at every step)... amazingly shown! Anon, you must be lucky to still have the sun! Where are you located? Australia? :-D We got our first blast of winter today. It's been snowing all day and temps are now below freezing and everything has a wonderful coat of fresh white snow. If it keeps up this way, this will be our first white Diwali! Do let me know how your lemon pickle turns out. Manisha, gorgeous recipe - can't wait to try it! 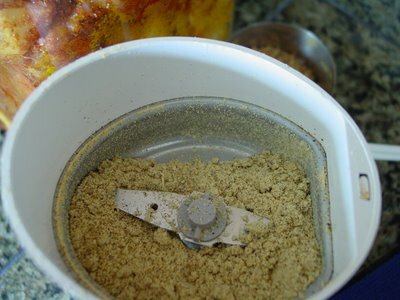 About the grinder though - in case you use your coffee grinder for grinding coffee as well as spices, put a piece of soft crustless white bread in your grinder and run it. This will wipe out the spice dust. Sometimes I've had to do it a couple times, but it works. YNL, welcome to IFR! Thanks for that great tip. Would you mind if I posted it as a Handy Tip and attributed it to you? I don't grind coffee beans at home but I have a tough time cleaning my spice grinder as it can't be washed under running water. Do let me know! I was served a lemon pickle in Santa Cruz over a year ago, instant love. Tried the oral directions, not really successful. Started your receipe a month ago but find mine are very salty and have lost color. Maybe too much sun? Naomi, after subjecting my lemon pickle to the Colorado summer sun, I wonder if there is anything like too much sun! Where are you located? If your pickle is not 'red' enough, I would not worry about it. Mine was far less colorful than the pickle my sister makes in India and what RP of My Workshop made. It depends on the type of red chillis that the red chilli powder is made from. RP used a mix of Kashmiri red chilli powder and Laxmi brand red chilli powder. If you find your pickle too salty for your taste, there are a couple of things you could do: squeeze the juice of another lemon and add some more sugar and red chilli powder. You will need to adjust these seasonings based on how salty your pickle is. I tried the adding more lemon juice and sugar and they are still a bit salty, I am eating them. This morning decided to try a slice of potato to see if that works. I am going to make another recipe and try honey instead of sugar as well as less salt. Still impressed by your wonderful pictures and directions. What is hing? Did not find it or anyone who knew about it. I must admit I am more than a little stumped. Usually adjusting sugar and lemon juice helps a lot. I am not sure what you are doing with potato - are you eating it with potato or are you adding potato to the pickle? If it's the latter, then it would be an experiment that you would have to try out. Hing or asafoetida is a resin that is used on a regular basis in Indian cooking. It has a very strong odor. Try this link for more info. You are driving me crazy with the step-by-step intensive instruction for the lemon pickle. Amazing to know that no oil is used. "You mean you actually grind coffee beans in your coffee grinder? Never do that. Repeat after me: Coffee grinders are for grinding spices!" I totally heart this statement :). Great recipe. I usually add hari mirch to this and well, don't add sugar :). But at times i have to make pickles with sugar bowing to demand from friends. Musical, our family version with hari mirch does not have red chilli powder and I made that with lime. Wow Manisha, looks easy and tasty. We have this old family tradition of making whole lime pickle with just salt. In an old ceramic jar with wide mouth, or more often, in an earthen pot, grandma would toss in lots and lots of washed and wiped lemons till more than half full. Next would be tossed in rock salt - lots. Tie the mouth with a cloth. And then, start rocking the pot. Grandma would rock it like a sea-saw, and then whoever would be sitting idle would do the same. May be 20 mins of rocking twice a day. Once in a while, the cloth on top would be untied to check if the lemons had turned brown and soft. And tasty beyond imagination. Above all, good for health - digestive power. Your post brought back a wave of nostalgia. keep writing. this typr of method making pickels hearing for first time. But its quite intresting. Thanks for step by step process. Pritya, what a wonderful tradition! This rocking you speak of is sending me on yet another mind flight about hypnotic and relaxing activities in the traditional Indian kitchen! 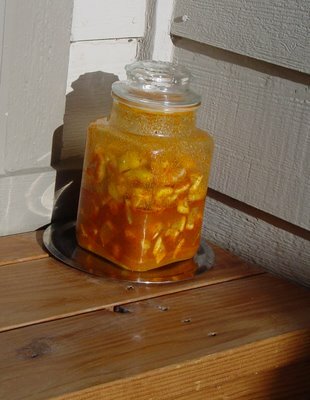 I made a jar of the lemon achar about a month ago, and try to put it out in the sun everyday. If I want to add big pieces or even full green chillies, at what point do I add them to the achar? Also, do I put salt on the green chillies before adding to jar? Thanks. Tina, according to me, the best time to add fresh ingredients is right at the beginning. Check out my lime pickle where I add green chillies, ginger and methi seeds. You do not need to salt the chillies separately. If I were in your shoes, I would start a new pickle instead of adding fresh ingredients that exude juices to the existing one-month pickle. The only things I adjust in a pickle, once the process has started, are the spices, salt, sugar and acid (lemon/lime juice), if required. Hope this helps and sorry about the late response! Thanks Manisha. I will leave the lime pickle alone - we prefer fresh green chillies anyway with our food. I see that your recipe says that the pickle is ready when it goes soft, so I will monitor that. My first time here. Am looking forward to trying some recipes. My mother has always made her own pickes. About time I had a go. Will let you know how I get on. can you place this pickle in a slow oven, say at 200? sunlight has been very unpredictable around here. Tina, let me know how it goes! Laila, welcome! This pickle is very easy. If I can do it, anyone can! I gave the last of my lime pickle away today and I am quite eager to make my next batch which will be all mine, mine, mine! Champa, Cooking it in an oven at 200F would be waste of energy. See what Anita and Pel have to say about the sun. I think you will find your answer there! Let me know what you decide to do and how it turns out. And welcome to IFR! The lime pickle has gone soft and we are enjoying it! As we will be away for a month, and the AC in the house will not be left too strong, should I put my big bottle of lime in the fridge? Thanks. Tina, if you think it's ready and you're happy with the softness and the flavors, go ahead and put it away in the refrigerator. That is what I do to make the pickle last longer. But remember that once you have done this, there is no going back - i.e. you shouldn't put it out in the sun again. I took all of my lemon pickle and most of my lime pickle as gifts when we went on vacation recently. I felt the lime pickle needed another week in the sun but it was delicious already. I left the jar in the window that gets the most sun exposure and also gets the warmest and two weeks later, it was done. And that found its way into a jar to some friends who were visiting me from the Bay Area. I have none left! Not lemon pickle nor lime pickle. I do have the one I cooked on the stove but it's not as good as the one cooked in the sun! I'll be making more this weekend. Manisha, you should label the pickles that you give to friends as "Manisha's Lemon Pickle". I am new in the field, and appreciate all the information here. Tina, glad to be of help! As for labeling, while your suggestion totally boosts my ego ;-) the recipe doesn't belong to me. It is an old family recipe. All I did was translate measures from vati to cups. And I do seriously believe that recipes are to be shared. Recipes and food are an essential part of our culture — any culture! I started a batch of this about four weeks ago. I let it cook for 2 weeks in the sun and then ha dit finish in the fridge (we went on vacation). It turned out terrific! Nice and spicy with a great balance of salty and tangy. This will be an annual summer recipe for me now! This looks delicious! Too late for this year, especially up here in VT... but next year I will try it for sure! One question, probably a silly one. Is the red chilli powder the same thing as cayenne? This looks super, & I'm going to give it a whirl tomorrow. Any idea about pressure-canning the stuff once it's done (mason jars in a pressure cooker)? Might that overcook it? Or - could one even let the mix sit in the sun for a week or so & THEN can it? I guess I'll find out. Thanks for the recipe. Also, for the sun-challenged, any thoughts on making this in a slow cooker? Say an hour on high with the lid on, then take the lid off & what, another 12 hours or so? 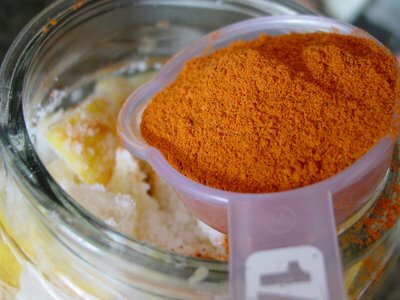 Blogcookbook, you can reduce the chilli powder all you want or use Kashmiri chilli powder which lends the red color but is not as spicy as byadgi or other red chillies. Glad it worked out for you! And, welcome! Kate, it's an annual thing for me, too! I made two batches this year, the first of which I gave away to family and friends. The second batch took longer cos the sun decided to play truant but couldn't keep that up for too long. We have a reputation for at least 273 sunny days here in Louisville! Welcome to IFR! Attfika, I am so thrilled that you tried it and liked it! Welcome to IFR! wilde1family, welcome and yes, nothing like homemade! I agree with you! Pelicano says that this pickle can be made indoors, given the right temperatures. I like the idea of the goodness of the sun trapped in the flavors of the pickle so I pickle mine outdoors. Laurel, check out what Pelicano has to say here - he cooks this in winter, too! Welcome to IFR! Cayenne pepper is a red pepper but its intensity is less compared to the Indian red chillies. You could use cayenne pepper, if that is what you have and/or prefer. zbdb, there's no need to can this pickle as it can last for a long time at room temperature (in a cool, dark place) because of natural preservation through pickling. Canning - to my knowledge - is not used much in India. I wish I could tell you what will happen to the pickle when it is canned under pressure and high heat. If you wish to make this pickle last longer, consider refrigerating it. But, if you do try canning, please let me know! I tried cooking this pickle on low heat - slow cooker was one of my options but I went with low heat on the stove. The taste is not the same. True, the juices thicken but there is no bacterial action. Check out the update to this post - towards the bottom of the post, where I have posted the results of slow-cooking this pickle. Welcome to IFR! Sounds like a great recipe! How long is the pickle safe to eat after its refrigerated? Thanks, Manisha, for your great family recipe. I loved the photos, too. I am going to try softening it in a slow microwave - cookbook writer Julie Sahni uses it for "sunshine" in her cookbook Moghul Microwave (perhaps it will be help for those without sun - here in Oregon our sun has gone away for the year, lost in the rain). But also thanks to everyone's comments - reading this has been really a wonderful food party - all the sharing and delight in lemon pickles. I felt that great connection with world food that makes a friendly planet! I declared my pickle ready last week (the lime pickle, after about 5 weeks), & it is terrific. I had a fair bit of sunshine to work with (Los Angeles), & kept it in the oven (gas w/a pilot light on) at night. Worked a treat. I wonder if pickling in a crock would preserve the colors better? Oh who cares. I couldn't be happier with the results. John and Pam, welcome! At least one year. I've never had it last beyond one year cos it's finished well before that. My sister makes her go for at least 2 years. It also depends on how well you treat it - no double dipping, no wet or damp spoons, etc. What I do is transfer a small amount into a smaller jar. I then pull that out for regular use. So the larger jar is not exposed to temperature shock or moisture and therefore lasts longer. Or at least I think that is the reason! Thea, sunshine is not as critical as warmth is what I am finding out as I read more and understand more about the process. zbdb, traditionally it is pickled in a ceramic jar, not a glass jar. And yes, the colors are preserved much better that way. I am glad you are all enjoying this recipe! A warm welcome to IFR to all of you! Kay, Came across your healthy lemon pickle recipe just now and it looks so tempting but the snow is here and unfortunately will have to wait till summer, really sad isn't it? Leila, no worries! And welcome to IFR! My friend Pel makes this pickle indoors in winter - I have not yet tried as I usually have enough to last me through the season. Follow the links in this comment above for more info. Manisha.. a quick question- is lemon the same as nimboo we get in India? Quickie, the Indian nimboo is much smaller than the lemon. Use about 12 nimboos for this recipe. Welcome to IFR! Thanks for the reply.. I shall try this soon! I tried this recipe a couple of months back and religiously put it out in the sun and stirred/shook the bottle very often. I used a plastic jar(Planters peanut jar) as that was the only large bottle I had in hand. The pickle is ready now and is a hit amongst my friends and even relatives. I thought I had sufficient to last a year, but I have less than 1/4 jar left for my family. I looking forward to some sun to put the pickle again. Thanks a ton for your recipe. Thanks for the recipe Manisha!! I tried your pickle and was placing it in sun for the past 2 months. We had it last week and we liked it very much. Planning to make another batch soon. After waiting patiently for 2 months yesterday we finally tasted the pickle I made as per your recipe.I will be glad if the bottle lasts a month!Super recipe.If only the sun shone all year around in Melbourne.Thanks for the recipe. What a FANTASTIC way to present a recipe! I'm sharing this with my friends who are getting in giant harvests of lemons, especially because there's no fat in it, and will thereby feel less sinful when you feel like reaching into the jar, and eating the pickle as is! -Do you think if I wrap my jar in a towel, that it will protect the color of the lemons from the sunlight? AskMuslims, I hope you liked it! Ramya, if you make it again, try finding a ceramic jar or a glass jar. These are non-reactive and a better bet to make pickle in. Also, avoid jars with metal lids. Let me know if you make it again! Sandhya, that is great news! Consider making the lemon or lime pickle with green chillies and ginger next! Poornima, you're most welcome! I am so glad it worked out for you! RawDietitian / Lorena, do let me know if you try it! Dino, thanks! I hope you and your friends like this pickle! I feel like there is something missing if I don't have a jar full of this pickle in my kitchen! There is no fat in it but beware of the salt content! Esilli, as long as you are stirring it everyday or shaking the jar every day, you're fine. If you look at my pictures, you will see that the lemon pieces are not all initially immersed in the juice. You don't have to make this in clear glass jars. In India, this is made in barnis or ceramic jars. You could definitely wrap it in a towel. However, I think you will still have more of a reddish color from the red chilli powder. Hi. Like this recipe. I make it with slight method variation. I cut lemons in half and squeeze the juice out into a separate bowl then finish cutting lemon into small pieces. 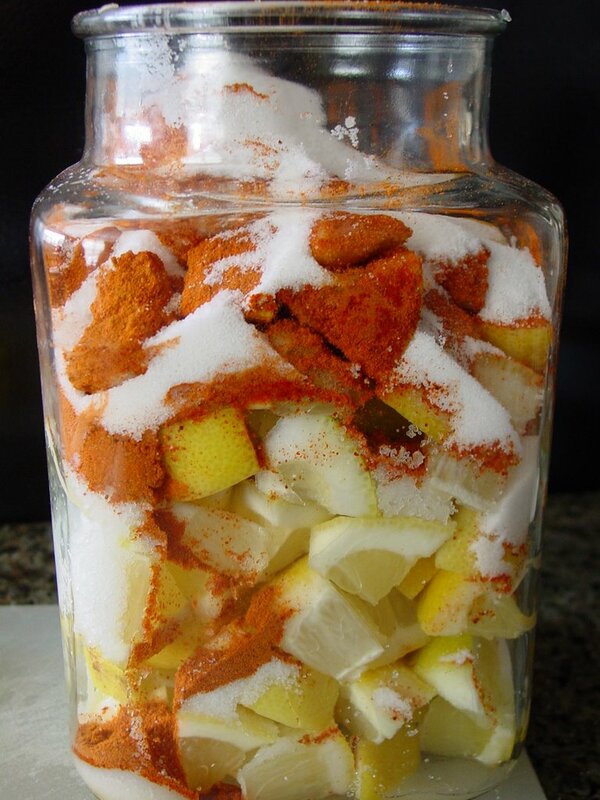 I put the lemon pieces in the container and mix spices in the juice then dump it in the bottle with lemons. Taste would be the same! you have inspired me to make a new batch! What if I wanted to put some oil in it? How would I do it? I will post my concoction when I make it! If you google lemon pickle you will find many recipes that include oil. It appears to me that most of them have you toast the spices in the oil before it's added to the pickle. Jennifer, it's great to hear about how you make your pickle! Sounds yum! Stan, if you wanted to add oil, you would add it once you are sure you are done warming it in the sun. Heat the oil till it is very hot and then let it cool. If you wish, you can add a tadka of mustard seeds and/or asafetida. Let the oil cool completely - this is very critical. And then pour it over the pickle. You can then mix it gently into the pickle. Hope this helps. Lorena, yes a lot of the recipes do. But it is very important to let the oil cool down before adding it to the pickle. Thank you for helping Stan! I have decided that this is the year I am attempting this recipe. It looks nearly fool-proof! It's been on my balcony for two weeks so far, maybe three. I'm going to transfer it to the roof of my workplace this week, for direct sunlight "cooking." Maven, I saw your post on Ravelry and then saw your comment here! I am so glad you liked the pickle and that you even added your own touch! Have made pickle with your recipe twice so far. Both times it was successful! Second time I did add some ginger and green chilli pieces and that worked out fine as well. Tumachi recipe aawadali mala. Me australia madhe ahe..
Hey Manisha... Gr8 recipe and pix... I live in India but in a place where it rains when lemons are really cheap and thin skinned...ideal for pickles.Can u post a recipe which does not require sun but can be done in a pressure cooker? Am desperately trying to look for one. Will give one of my aunts a call to see if she can help!!!! I can hardly believe the longevity of this discussion...amazing! Hi Manisha, Just LOVED this page. What an easy way to make pickle - and the photos are great!! I actually made it, too - my first pickle on my own! !And now it has been on my window sill for two weeks. I also put a lable on the bottle with the date, so that I don't need to keep track of when it will be done. I am in Vancouver and we still have some sun so the pickle get few hours everyday. A quick question - should I keep the cap closed tightly or should I just cover it to let the moisture evaporate? Back home I remember my mother used to tie a fine cloth on the Mritban (Pickle Jar). Please advise! Thanks and keep up the fab blog! Kalidas, I am glad it worked out for you! Try adding carrots next time - that also works well. Enjoy the upcoming spring and summer in Australia! Gaurav, that is a bummer! That you get the right kind of fruit but it's too damp and humid to make pickle. I haven't made one in a pressure cooker but I have cooked this on the stove top on very low heat until the lemons have softened. It's what I would do if I couldn't cook it in the sun. I have also been told that it is warmth that is needed and this can be made in winter, too. I must have done something wrong because I wasn't successful. Lorena, once a good thing, always a good thing! But yes, I am surprised, too! Sonika, it really is the easiest pickle to put together! This summer I tried making some with soft cloth wrapped around the mouth of the jar instead of an air-tight lid. It didn't work for me - and the weather may have played a large role as it was more humid than it normally is - but I had to throw it away. Luckily it was a very small batch so I didn't feel as bad. Check with your mother to get exact instructions. What I can tell you is that an air-tight lid works. Open it up every once in a while to stir it or give it a good shake. After they cooled to room temperature I added all ingredients mentioned and Voila I had the pickle ready in about a weeks time with NO SUNNING at all!!!!! Kay...you can make the same pickle without the sugar and follow the pressure cooker technique... I did so and it simply tastes great!!! 1)The jar should be completely dried in sun or under the fan. 2)Use paper towels as you are making pickle or a thin muslin cloth to wipe your jar/hands. 3) Most important... dry roast 1/2 tsp hing/asafoetida and as soon as it starts to smoke ..put it in the empty jar for a few minutes..swirl it around and throw it out.It disinfects the jar. 4) Fill your jar to the brim with the pickle and then wipe the extra masala on the rim with a clean paper towel. 5) Put a clean cling film to the mouth of the jar and put the lid of the jar.Tightly screw it in place. 6) Every time you open the jar to stir the pickle..Use dry and clean ladle, wipe the rim with a clean paper towel and put a fresh cling film before you put the lid back. Your pickles will last you the entire year!!!! To be on the safer side I do add a little sodium benzoate powder after a few days of curing of the pickle for a longer shelf life.But Lime will not need it as they act as a preservative along with the salt in them. Thanks for the great recipe. I followed it absolutely with meticulous sunning! and now i have a great bottle of lemon pickle without oil that everybody loves! ofcourse. i specially loved your advice on coffee grinders and indian spices!:)! love you recipe. I have about 25 lemons sitting in a bag. All ripe. Not enough sun through the day. Should I attempt cooking v/s sun? Manisha do you think this would work in the winter on the counter with a the low heat of a heating pad? Robert, are you the Robert I think you are? Hmmm? She thinks the blog is belong to her because once we played an April Fool's trick and switched blogs for a month. Her readers cried and lamented their loss, while mine clapped with glee. Wait a minute...what am I saying?! That did not come out right! My readers were thrilled by the ingenuity of the ploy whereas her readers cried. That's a little better I think! She answered your question partly. Do read what Pel has to say. He's the king of all things pickled and gets himself into one from time to time, too. 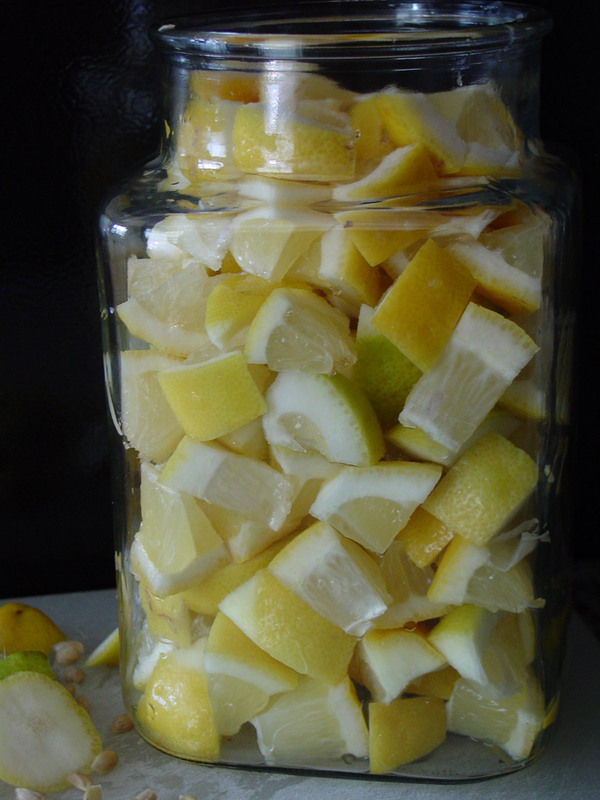 I tried pickling grapefruit in winter and it did not work for me. Since pickling is actually a process of fermentation, I would recommend that you keep it in a warm place - by a vent or near your furnace if your utility room stays warm. D, same advice for you. It doesn't taste as good when cooked. I have two jars sitting in my refrigerator that I use for sandwiches. The one cooked in the sun is almost gone. Gaurav, thanks for sharing your research! Vidhya, so glad it worked for you!! It is my fave pickle! I just had to share...I did it! I just put up my first jar of lemon pickle!!! Deliciousness will be mine in 2 months..lol! Mine came out well even in winter. I live in the SFO bay area. I'm not sure what happened but I posted a comment last week and it's not here...I wanted to let you know that I have finally put up a big jar of lemon pickle! It should be ready around easter sunday...woohoo!!! Lorena, my apologies! I set comments on old posts to 'moderated' because of continuous spam I was getting on some of my older posts and then I completely spaced out on it. I am thrilled for you and with you! Depending on the amount of sunshine and how hot it gets, remember that your pickle could be ready sooner than a couple of months! Yay for you! Padma, did you make it with Meyer Lemons? If so, I am sooooo envious!! Manisha ~ I'm giving it a try. 5th day today and so far so good. Curious though....noticed a bit of 'whiteness' on the top layer of lemons, is that normal and okay? WLCOME HOME! Hope everyone enjoyed Yosemite & the Amtrak trip. Cynthe, make sure that the layer on the top does not dry out. 'Whiteness' is not something I have encountered and I would be concerned if that were mold. It could also be the salt crystallizing again. Do let me know what you think of it when it's done! I got 6 big lemons from market today and was thinking what I can do with it. I bought them because seeing lemons here is not so common. Well, the internet came handy and I came to your blog through my search on lime pickle. You had exactly what I was looking for and more...You had added photos. That made me look at your blog more closely. And I need to tell you that you are a good writer and a good photographer. Your statement about your photographs being blurry is nowhere true. And you can consider yourself a good photographer writer, a combination which is rare but perfect to spread out your name. I am not sure if you have already thought about it but there can be publications just ready to accept your contents and photos. Please try that way. There are online publications (DIY books) on www.lulu.com You can consider that just for making prints of your own blogs or publishing books for others. BTW I tried to make the pickle cooked as no Sun is guaranteed where I live. It tastes GREAT. I just have to find some friend to share half of it, as I am the only person at home who loves pickles. I am a frequent visitor of your blog and love your recipes. I have drolled over the pickle recipe for quiet some time, but finally decided to make it yesterday... yay!... I am so excited. 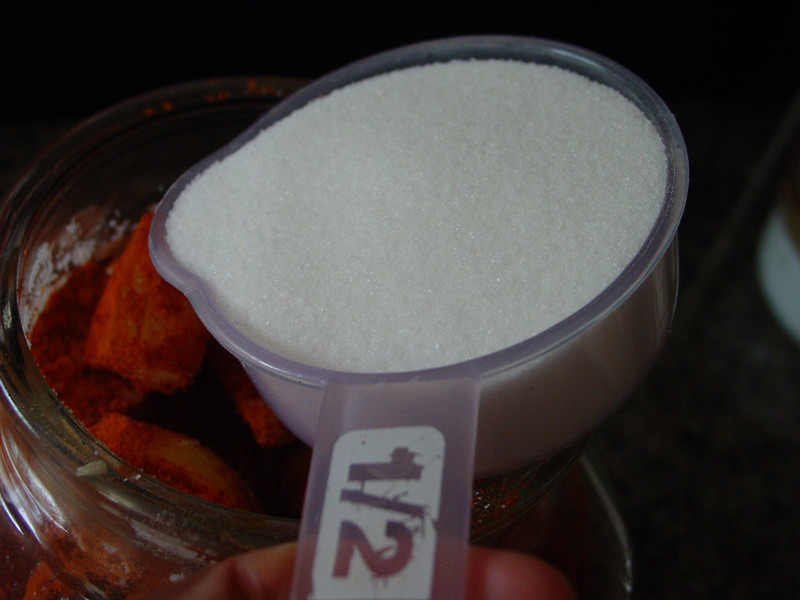 Only thing is I did not have a measuring cup, so I eyeballed the salt, mirchi and sugar. Now, its been a day and I did taste it and feel like adding more sugar and salt. Should I wait for sometime to see if the flavour changes and then add the salt/sugar or is it Ok to add it now. Thanks a lot. I want to make this for our big family get together. Unfortunately that is in two weeks. I've seen some pickle recipes that blanch/boil the lemons for a few minutes to soften the skin. Do you think that could work with your recipe? And do you think it could speed it up to 2 weeks? And I have two more questions...What kind of salt do you use? I generally use kosher salt in the kitchen (so that is what I have.) Because the crystals are larger there is less salt in the same measure. I've seen many places where they recommend using anywhere from 1.5 to 2 times as much kosher salt as regular table salt. Your photo looks like regular table salt, but it is hard to tell from the photo. Regular kitchen salt (here in the US) has iodine in it. So I'm wondering if that could make the pickle not come out right or have an off taste? NoOneButMe, thanks for all your wonderful compliments! I'm so glad you liked the pickle, even though you had to cook it. I still have a huge stash of cooked pickle that I use on sandwiches for a quick burst of flavor! Jyoti, I would add more sugar and salt now, if that is what your tastebuds are telling you to do. Pel tells me that he thinks the lemons are cured by the salt and the fermentation experts tell me that they think it's a process of fermentation as the pickle, when ready, does not taste sweet. I'm not sure who is right but I wouldn't add too much sugar. Rothrock, try ISG's lemon pickle since you don't have much time. It's a great tasting lemon pickle and she preps her lemons by dunking them in hot water for 10 mins. Not really blanching but halfway there. I haven't tried using my no-oil recipe with her method of prepping the lemons. It's something I might have to try this summer as I don't have much time left to make pickle. Thunderstorms every single afternoon! I use regular salt - with iodides and there are no issues with taste. I don't have much experience with kosher salt. I would suggest that you approximate and err on the lower side. Taste the pickle after a couple of days and add more, if necessary. Do let me know what you do and how it worked for you. I am always looking for variations and new things to try with this pickle. Thanks. I decided to try both your lemon and lime recipes doing them your way first so that I can have some experience before I try and change it up. Fortunately a nice Indian guy at work got his wife to give me a recipe for southern style green mango pickle. It only has to sit for a day so I will be able to make that. And if we get lucky with enough sun and all, who knows, maybe the lemons or limes will be ready. Thank you so much for putting this out there. I've wanted to make pickle for about 5 or 6 years and have never dared. As as a gora I don't have any relatives who could help me out. Okay, just a little over a week and I tasted them both for the first time. The lemon is already delicious! I will have no problem serving it to my family next week. The lime is still a little too crunchy and not quite ready. Of course I did start it one day after the lemon ones. So I think it will be ready by next week too! I've also made ISG's oil lime pickles and they are very tender and tasty. I think they will be better with one more week to let the flavors mingle. And finally -- do you see what kind of pickle monster you have created? -- I made chili pickle based on the recipe at manjulaskitchen.com. Thank you so much for getting me started. They are so much better than the stuff you get in the bottle! Can you mix the spices and lemon wedges together in a large pot or something before you put them in the jar? Seems like that way you could really coat the lemons well. Rothrock, pickle monster?! That's really hilarious! I am so happy that everything came together for you. If you take pictures at your family event and would like to share them, please feel free to share them here! And yes, once you start making your own, it's very difficult to go back to the bottled stuff. I'm new to lemon pickle. I bought a jar of Shan and I want to serve it, but I don't know how it is usually eaten. Do you put it out as a side dish? or next to a sandwich like we do with dill pickles? I too used Manisha's recipe with a slight difference. We in the southern parts dont like sugar in our pickles. So, I left out the sugar. But I also found that we need to put in a lot more lemon juice than Manisha has said. Also I added Sarasaparilla and mango ginger into the mixture. My family like it more than the factory made ones. I HAD THE PROBLEM OF SUN, I COOKED IT IN MICROWAVE BY PALCING THE JAR INSIDE FOR 10 MIN AT 70%HEAT.IT WAS WONDERFUL.TRY IT. Kindly refer if time permits. Thank you once again, and keep up the good work. Just about ready to enjoy both the green and red pickle.They smell heavenly.This has become a summer ritual really.Thanks so much. I love your recipe, and I'm dying to try it out. I just read a recipe like this from my favorite cookbook, but it didn't call for many spices. I'm wondering... I live in the cool SF bay area. Do you think it will work now, or should I wait till august? I have followed the steps to make pickle. It is second day, I am putting daily in sun light with lid to cook. The pickle gravy started testing bitter now. Is this normal? When I put in sun light, should keep the jar lid closed or open it? TheIrrerverentCook, sorry this is late but I'd wait till it got warmer only because I, personally, have not been successful with pickles in cooler temps. However, my friends Anita and Pel insist that they have pickled right through winter. samir, the lid should be closed. I really don't know why your pickle is tasting bitter. Did you burn or over-toast your methi seeds? I'd wait a few more days for the flavors to meld and then taste it after a week or so. I might have little overcooked methi, but not that much. Now pickle started testing less bitter. I am hoping as it gets more suntan, the bitterness will go away.. I'm so happy I stopped by your blog--I have a dear friend who loves lemons and Indian cooking. Her birthday is coming up and these would send her over the moon. Thanks for sending us a tweet! It's nice to 'meet' you. Hey Manisha, I commented on this post in Dec,2007 and 4 years later, I finally tried this recipe. The pickle is sitting on my windowsill patiently cooking in the desert heat of Kuwait. I've wrapped the jar with clingfilm and covered it with couple of plastic covers to keep the dust off. Its 5 weeks now and I think it may be done. Will check and let you know how it turns out. Thank you for the unique recipe. I really enjoyed these pickles when I made them a while back! Next time however, I will not include the hing. My friend makes them without hing so I was able to compare and the hing flavor in my pickles was too strong. Except for that, I preferred mine...for texture and general flavor. My pickle is ready! I let it sit in the sun for 7 weeks and its done. Tastes awesome! really yum.. I just opened my jar of this pickle after 6 weeks in full sun. It is delicious! I will never buy pickle again! I wonder if in the winter I could make this in an uncovered slow cooker, leaving it on Low for say 12-24 hrs. Must try that and let you know! MY MOTHER MAKES THE BEST LEMON PICKLE WITHOUT OIL I HAVE EVER TASTED IN MY WHOLE LIFE!I AM NOT KEEN ON CHILLIES OR OIL BECAUSE THEY TAKE AWAY THE TRULY THERAPEUTIC VALUE OF A FINE LEMON PICKLE KISSED BY THE SUN , I HAVE SOME FABULOUS LEMONS GROWING IN MY BACKYARD AND I HAVE LEMON PICKLE ON MY MIND A LOT THESE DAYS . LEMON TREE VERY PRETTY LA LA LA...LUV RACHNA BAHADUR ,DELHI,INDIA. i made lemons using this recipe, and while i can't say that i followed the recipe precisely, they tasted absolutely wonderful. i was wondering though-- as the lemons settle and soften and fall apart, when do they become TOO soft and gooey. mine are older and are sort of a jam consistency, and while they taste amazing, i wonder if you'd toss them out. also-- what is the difference between moroccan preserved lemons and pickled lemons? aside from the spices. 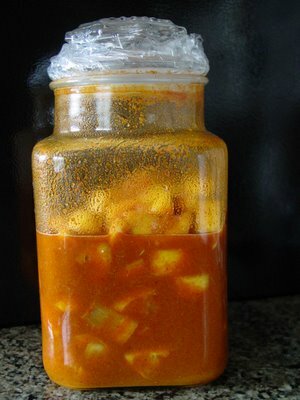 Since last two days its been raining and no sun do u think my achar willbe ruined i just made it 2days back. this pickle is the good combination for upma. i dont look upma but if this lemon pickle will be there i am the first person to eat upma. I made this pickle last October and it was awesome. Now only a little bit is remaining and I'm planning to do it again.The most wonderful thing was that the pickle did not spoil a bit. Thank you . Any lady who can give me this pickle? I can pay any money for this. I noticed that some juice has come outside the bottles though the cap was intact.Next day when I took the bottles to keep in the Sun,I noticed that lot of juice has oozed out on the table.After keeping the closed bottles in the sun,I went to the backyard and found that the cap of one bottle had flown to some distance throwing lot of lemon pickles on the floor. I brought both the bottles inside. When I tried to open the other bottle,lot of pickles were thrown on the table.Some fell on my dress also. I want guidance whether I should keep the bottles outside.It appears that lot of Juice has been lost and the remaining pickles have become thick. I love this recipe and have put it in my pinterest and shared again and again. One major problem... My pickles never make it to 2 months we are doing good if they last a month. I guard them for two weeks and then, mysteriously, they start disappearing at every meal!!! One day I will make enough to get a few to the two month mark and be able to claim them ready. lol I live in the south on the coast so sun is never a problem so they may get ready faster here. Thanks for a keeper recipe!! Hi this is great. What is the size of that jar? Hi, this looks a great recipe and I am trying it - can you tell me what is the size of your jar by volume, please. I made this two years ago and I still have some left. It seems to keep for quite some time so long as you are careful to not introduce any moisture. I am starting another batch today. Thanks for the awesome recipe! 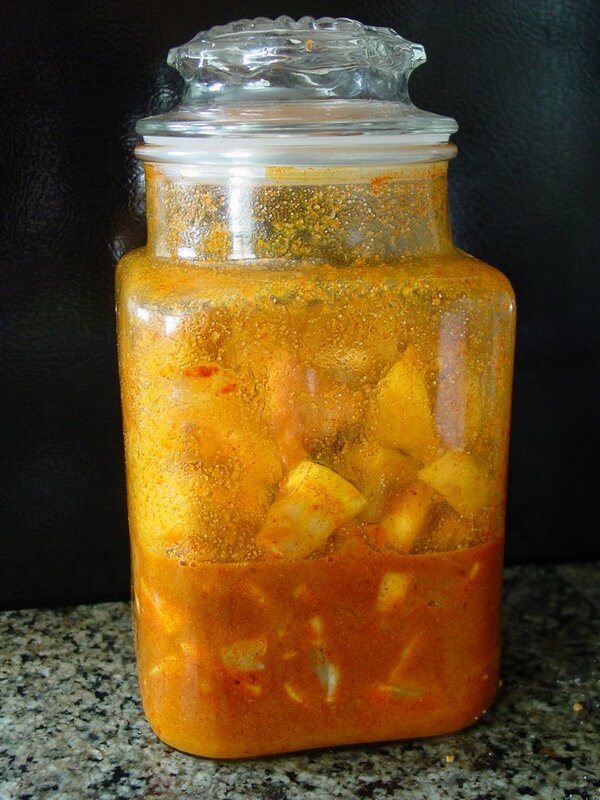 I had made this yummy pickle in 2009 which lasted for not more than two months. Made it again the same year and it was over too soon. I could not make the last two years. It is 5 days since the bottles are getting cooked under the hot sun in Oman. I am really ashamed i didnt say thank you in 2009. The pickle is wonderful and the best lime pickle i have tasted till date. Michaela, I hope your friend enjoyed these pickles! Joyce, that makes me very happy! Enjoy! IndigoBlues, use this recipe as a guideline and feel free to make it your own. 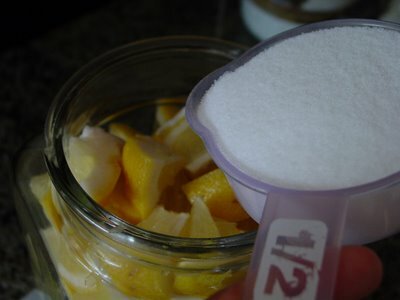 I would not fiddle with the basic lemon:salt:sugar ratio. The spices are up to you to adjust to your tastes. Good luck! anna, you are an inspiration! Rachna, enjoy your lemons your way! spooky, I have never had to toss them out. My pickles get over rather quickly! I have had to toss out store-bought pickles though. It isn't so much the consistency but the smell. It changes to something that is akin to a dull stale smell. At that point, I would toss it out. Nita, I'm sorry I missed replying to your question earlier. Keep the jar in a warm place and set it out in the sun, once it is out again. That works for me as it rains in summer here, too. Kavithanjali, I agree with you wholeheartedly! Upma with this pickle is quite awesome! sarita, thanks for that feedback! It depends entirely on how careful you with it, which I am sure you were! No double dipping and no wet spoons! mittalji, it's so easy to make! Why don't you try it! The closest store-bought pickle is Priya's lemon pickle. That might be your other alternative! krishnamurthy, I wish I could help but I have not had the same experience as you and I have been making this for years now. I would, however, not recommend using bottles with metal lids. If you must, don't cover the jar with the lid. Instead make a makeshift lid by covering it with several layers of cloth and securing it to the jar with a rubberband or string. In the past few years, I have started using parchment paper in between the lid and the jar, to prevent any plastic parts of the lid from coming into contact with the pickle. Good luck! Xerix, ha! ha! It sounds like you have some members in your family that sound very much like a couple in mine! Every time I open it up to stir, there are a few drooling mouths that want to taste the pickle or lick the spoon clean! So happy that you and your family enjoy this recipe, too! Sasi, it's mentioned in the post. It's about 2l in volume or half gallon. eskaton, yes, you have that right! Enjoy this recipe! I added julienned ginger to this recipe, like I do in my lime pickle and it works really well, too! Try it! Susan, oh please don't be! You don't have to thank me because just the fact that you make it and enjoy it, makes me very happy! Hugs! Oh. My. God. This is one of the most AMAZING things ever. I'm married to a Bangalee, and I've cooked and eaten Indian/Bangladeshi food for 30 years, but I just started making homemade pickles, and just tasted my 2 1/2 week old lemon sun pickle - I think it is ready. This is seriously one of the best things I've ever tasted in my life. I'm going to start a new jar very soon because my daughter's going to want some of this one. I have not had lemon pickle in over a decade. My mouth is watering every time I look at the photos! Can't wait to make this. I have all the ingredients, but I think I may leave the hing powder out - the smell just in the bottle is too overwhelming. Is it really necessary? It's such a small amount. Thank you so much for posting with such detail and great photos! pjningal, thank you! This recipe is a keeper and even though this post is now over 6 years old, I am always thrilled when one more person writes in to say they loved it! What about using Hing Powder if cooking on the stove. Will it still mellow? My first try will have to be on the stove, as we are leaving town in a month and I do not think that would give it enough time in the sun. So, do you think the Hing Powder would still be a good decision on the stovetop? Thank you for your input. ... and will the Hing Powder make your skin and breath smell like Garlic does? john_cindi, yes! Hing mellows on cooking, especially when it is added to hot oil. But that's just a general tip as there's no oil in this recipe. 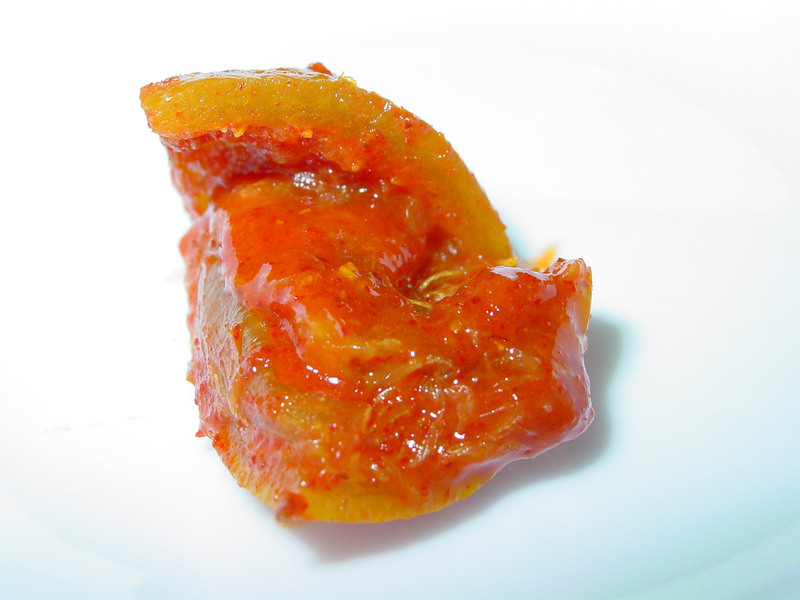 If you don't want to babysit the pickle on the stovetop and you have a slow cooker, then see Anna's feedback on my lime pickle post. And, no, hing does not make your skin smell. But I might be the wrong person to ask because I love the aroma of hing! 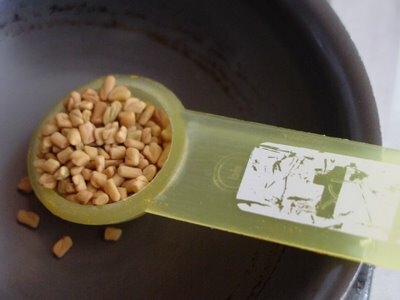 I store my container of hing in another container that contains a layer of a salt and flour mixture. This way, the aroma does not mix with that of the other spices and it also ensures that the hing remains fragrant longer. Thank you so much! Can't wait to do this! Just wanted to let you know that I made this pickle and it is so delicious! Thank you for sharing the recipe. can my lemon pickle ferment? Fleurette, you're very welcome! That you liked it makes me very happy! Michael Henwood, there is divided opinion about this pickle - whether it ferments or it cures. Given the amount of salt in it, I would say it cures more than it ferments. However, the end result does not taste sweet despite a fair amount of sugar, and that has led many folks to believe that this pickle ferments. I'm not an expert on fermentation but what I can tell you is that this pickle is pretty darned good! It's ready when the peel has softened and the white pith has absorbed all the spices. It won't be crisp or bitter at this point. thanks manisha, this is the second time i make the pickel, however this time 2 of the 4 jars started smelling like alcohol. its weired cause only 2 have gone off. Hi, just thought I would share my experience! Especially as I have read and re-read this and all the comments a million times to help me deal with some challenges! Having grown up with Indian food and taken its provision for granted, I find myself living alone and having to make do and mend. I've reached a time where I am keen to make things from scratch and making pickles always feels like alchemy! Or at least an art. I went to the supermarket to do a regular shop and they were selling off bags of lemons for pennies so I randomly put a few bags in my basket without thinking what I would do with them. They are always good to slice and freeze for gin and tonic! I then googled lemon pickle...hurrah everything was coming together when I found this step by step picture recipe. I love your picture by picture instructions and had all the ingredients so off I went using the stove top method. Winter in England doesn't make the sun soaking method feasible. I had to convert the cup measurements to grams/spoons, being from the UK where we use cups for drinking tea only and not as a measuring device. I used a website to help me and learned that half a cup of salt is 4 tablespoons. I made a batch which was inedible because it was soooo salty. And too hot. I had put less chilli in than stated because my chilli powder is extra hot, but even so it was hot. So I made another batch thinking I would under spice it and mix the two. But I put a very small amount of salt in thinking that it was needed chemically to produce the pickle. It was certainly a better batch and I mixed the two. I tried it today but the salt is still killing it. So as I write I have a third batch cooking which has used up the remaining lemons. I have not salted it or put chilli in. In a couple of hours I will mix the three batches. Still, my plan is if this doesn't work as a pickle to spread on food or eat with a meal, what I will do is use it to mix to currys...e.g. A potato curry with lemon achar and I think that will be lovely. The colour and aroma of the pickle is lovely...it certainly does feel like alchemy when you start with a turmeric-lemon colour and then watch as it gradually turns to a deep amber and then a gorgeous ruby colour. Despite having got the flavourings wrong, I'm starting to feel like an expert at this with all this experience! Thanks for getting me started on my pickle making journey. I am going to try a dried carrot one next. The carrots will have to be dried in the oven without any hope of sunshine here. 2) I cooked it for 16hrs in the oven at around 80C (~175F) in a cast iron pot with a heavy lid. 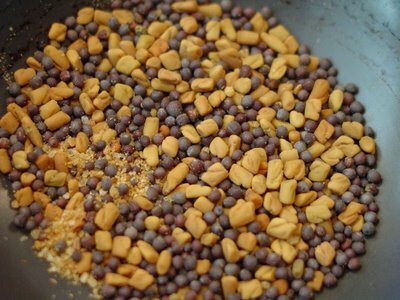 How vital is the asafoetida to the finished product. I live in Montenegro so lemons are plentiful right now but Indian spices are not (I smuggle them in whenever I get the chance :-). I have everything except asafoetida. Is there something else I could substitute or shall I just leave it out? thanks so much for this post. can you tell me which state/region this recipe is from? my friend says it reminds her of a maharashtrian pickle. i've made this lemon achaar thrice and it is divine! each time i've made variations depending on ingredients on hand. first one i made it without the hing and a bit less chili, and the pickle turned out fantastically. second one i made with rampur limes from our tree. it is sitting in the warm san francisco sun (yes it does exist!). third one i made with more chili and added hing. it looks beautiful. I am in dire need of help! The first pickle is cooking just great! The second one - smells funny. Everything I used was dry as were the lemons and my hands. Could it be the garlic I added into the jar? perhaps the salt was a little low? I bit into it yesterday (only been 8 days) and it tastes ok but it smells funny. How can I fix it? Should I just let it cook and then chuck it if it looks and smells bad after about2 weeks? Also, can I add the juice of another lime and lemon 3 weeks after letting the pickle cook in the sun? fullmonte, leave it out. It's only the salt and sugar that are critical to the pickle. The rest of the flavoring is up to you. desixlb, it is indeed a Maharashtrian pickle! Dazzling Ditz, if it smells bad, don't eat it. I haven't pickled garlic with lemons like this before. I'm so sorry! I wish I could be of more help. I have successfully added lime / lemon juice after the pickle was ready. You may need to add some salt with it. I can't believe I've been eating Indian food for years and I just discovered the lemon pickle! I'm glad your recipe doesn't have the added oil, it's just not necessary and adds hidden fat content. (not covered by the brine) have a different color to them. Slightly lighter, the rest of the peels are still vibrant bright color. I turned the bottle upside down and the same thing started to happen at that end. I've opened the bottle a few times to stir the contents with a clean dry spoon before this. I'm wondering if this is yeast, and not good. How does mold look like in a lemon pickle? I'm confused - I tried another recipe before with instructions to keep in a dark place (no sun) for a week. m, thank you for your patience! My recipe does not call for softening lemons in brine. There is no added water in my recipe. There is salt, lemon juice and any juices that may run from the lemons due to the hygroscopic nature of salt. I shake my jar every day and, in all these years that I have been making this pickle, I have not seen any mold in any of my jars. As long as you are not seeing any growth - whether whitish or bluish - in color, the pickle should be fine, in my opinion. Additional tests would be smell and taste. If either seem off to you, pitch it. If you aren't shaking the jar or stirring it everyday, I can imagine that there will be slight discoloration of the peels but it's not something I have seen because of the method I follow. I cannot give you advice about the other recipe you tried. Leaving it in a dark place has never worked for me. I am not sure if it is the salt-lemon ratio (Indian nimboos are much smaller than both our lemons as well as limes) or if it is the acidity of our fruit or if it is the water content of our fruit. You might be better off asking the author of that recipe. You could cover your jar with a thick muslin cloth should you wish to do so. It depends on where you live. It generally doesn't rain in India during the season when nimboo pickle is made. It is, therefore, possible to leave jars out in the sun without worrying about rain. I live in Colorado where afternoon thunderstorms are the norm, especially in summer, which is when I make this pickle. The rest of the day it is hot and dry and my pickles tend to dry out; not so much in India because of the higher level of humidity. I prefer to have them in an air-tight container and open it to stir the pickle, at the very least, every other day if not every day. That one teaspoon of oil makes not much of a difference to the pickle, IMHO. Hi Manisha, it is me again lol! Now ... THIS year ..which was tremendously hot I expected my lemon pickle to 'cook' very quickly ... but in fact ...they have been out on my balcony cooking for months ie since June ! Thank goodness for the long hot spell ...or they would never be ready. I am not sure why they took so long .... I even added some extra lemon juice about 6 weeks back as it was very difficult to mix the pickle when I shook it ... and remains so ! The lemons were not dry, they were quite juicy! So... I just popped onto the balcony and brought it in .. and tried it !! lol! VERY hot/spicy this time .... and the lemons are still fairly firm .. despite almost 5 months in late 30's upper 40º heat ! I must check that my lemons are thinner skinned next year. Perhaps that is the problem. I am also going to split the amount between TWO large jars to enable me to shake them mixture more easily! Is there anything you can suggest that will soften the lemons a little more ? I am loathe to heat it ... unless you think its a good idea ! Susan, quite honestly, I am stumped. I would not heat it, not at this point. Were the peels thicker than usual? Were the lemons bigger than those from previous years? In both these cases, it could be that more salt was needed. I end up using citrons which have a fairly thick skin but they always soften rather quickly. If the lemons were juicy but the resulting pickle was difficult to stir, I think that leads me back to salt. I just pulled out a two-year-old pickle and, even though it is thick, I could stir in more lemon juice if I wanted. If you wanted to experiment with it, you could take a small quantity and add both lemon juice and salt to it and see if it makes a difference. I would also add a bit of sugar to balance the flavors but it is not critical. Thoughts?